B -Seite Festival is in search of artists and contributors to the categories exhibition, performance, workshop and talk. The submission period ends on 15 January 2016. The exhibition is an essential part of B-Seite – festival for visual art and contemporary culture. We are delighted that you enrich us with your artwork. B-Seite’s exhibitions show (audio)visual positions of media art and lighting design – from classic video art to reactive room installations and interactive projections to robotics and multi-sensory experiences. We are especially interested in works connected to 3D print we also offer the possibility for big size mappings in our famous courtyard. Performances are an essential parts of B-Seite. We are delighted that you enrich us with your artwork. We are especially interested in AudioVisual Performances (AV) and works which can be shown in the urban areas of the city of Mannheim. Interactive, cross-disciplinary and interdisciplinary performances are very welcome. 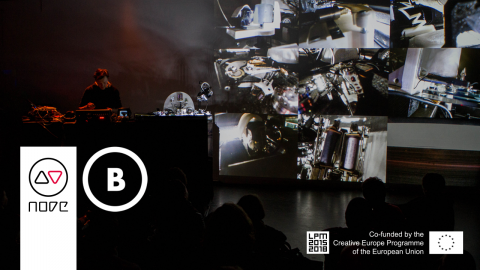 The talks are an essential parts of the VJ Conference which takes place during the B-Seite festival. We are delighted that you share your expertise with us. B-Seite curates recipes for success. We refine and taste. Talks impart background information and methods to all interested parties – be it artists or visitors, professionals or newcomers. Together we discuss artistic processes and new technologies, their utilization and their social relevance.